LSU AgCenter began the Louisiana Master Gardener Program in East Baton Rouge Parish in 1994 as a pilot program. The program was approved in 1997/98 and expanded statewide. The first Louisiana Master Gardener class in the greater New Orleans area was conducted in 1998 in New Orleans by Orleans Parish Horticultural Agent Dan Gill. The following year, Dan Gill taught a class for Orleans and St. Bernard Parishes and Jefferson Parish Horticultural Agent Dr. Jerry Sisk taught a class in Jefferson Parish. Orleans, St. Bernard and Jefferson Parishes continued to have Master Gardener classes and groups in each of these parishes attended continuing education events as well as worked on community projects together. The Master Gardeners in Jefferson Parish began to have regular meetings and the first elected president of that group was Eddie Castelin. 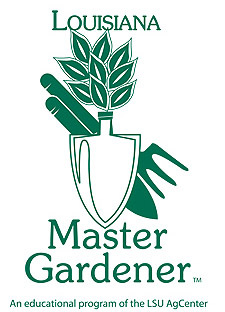 In January of 2004, Master Gardener graduates throughout the greater New Orleans area began meeting together at the Jefferson Parish AgCenter Extension office and New Orleans Botanical Gardens. This group drafted Articles of Incorporation and Bylaws which were adopted on July 19, 2006 officially creating the Master Gardeners of Greater New Orleans (MGGNO) for Jefferson, Orleans, St Bernard, and Plaquemines Parishes. The first General Membership meeting was held on August 8, 2006; Executive Officers were elected; and, several committees were established. MGGNO blossomed under the leadership of Horticultural Agent Karen Blackburn who became the Master Gardener Coordinator for Jefferson, Orleans, St. Bernard, and Plaquemines Parishes in 2007. By August of 2008, paid membership in MGGNO reached 134. Louisiana Master Gardeners (LMG) must fulfill annual continuing education hours and volunteer service hours’ requirements of LSU AgCenter to main their individual certification as a LMG. Local LMG associations are affiliated with LSU AgCenter Cooperative Extension Service and establish and/or promote projects – with oversight from the Horticultural Agent(s) – aligned with the annual requirements. MGGNO began with public educational seminars; on-site support of the New Orleans Spring and Fall Garden Shows at New Orleans Botanical Garden; gardening and beautification projects within the four parishes; field trips; and, other similar group-supported functions. In 2008, MGGNO began mentoring students in LMG training classes to encourage and guide them through the process and training and to better integrate them into the program after graduation. In August of that year, MGGNO hosted what was to be the first of many public symposiums on gardening with a goal to conduct at least one public educational event per year on various timely gardening topics. MGGNO successfully hosted the 2009 Louisiana Master Gardener State Conference at the Hilton New Orleans Airport in Kenner, Louisiana. The conference was attended by 258 Master Gardeners and guests. There were 23 national, regional, and local speakers, eleven of which addressed the full conference. The keynote speakers were New Orleans’ own Chef John Besh and Square Foot Gardening guru Mel Bartholomew. By 2009, MGGNO members began to represent LSU AgCenter at several of the areas Farmers’ Markets, distributing information and interacting with the public. That spring, MGGNO initiated its Hollygrove Market & Farm Project. For the first time, MGGNO volunteers had a long-term project where they would plant and maintain raised vegetable demonstration beds for the purpose of educating the public. MGGNO hosted monthly children’s-activity days in and around the garden beds to stimulate young people’s interest in vegetable gardening. This garden and its MGGNO volunteers have been featured on DIY network, local radio talk shows, as well as by the local newspaper. In late 2009, MGGNO initiated another long-term project at the ARC location in Uptown New Orleans featuring a perennial and cut-flower garden. Members volunteered on a regular basis to work with the intellectual and developmental disabilities program participants and their instructors in the garden or greenhouse. This project’s garden was featured in the 2010 Secret Garden Tour and has been written about in the local press. By 2010 we saw an increase in interest in school gardens. MGGNO volunteers assisted in establishing numerous public school gardens and implemented the Junior Master Gardener program in several schools through the directions of Orleans Parish Agent Russell Harris. MGGNO launched its independent website – www.mggno.com – in 2010 to provide a one-stop information shop for both MGGNO members and the public. The website features gardening tips each month which are archived on-line for review and/or research. Other features include a schedule for MGGNO meetings and activities as well as local gardening events and activities; MGGNO community projects; and, MGGNO handbook, forms and club documents. In July of 2011, MGGNO was approved by the IRS as a 501 (c) (3) non-profit organization. By 2012, MGGNO had initiated and revisited a wide variety of volunteer projects. Old friendships were renewed and new ones formed with Longue Vue House and Gardens, Audubon Zoo, World War II Museum, Secret Gardens Tour, Parkway Partners, as well as the New Orleans Botanical Garden and New Orleans Museum of Art. In the past several years, MGGNO has continued to grow both in scope and membership. While support of the Fall and Spring Garden Shows in the New Orleans Botanical Gardens at City Park continued to be a major focus, in 2014 a Speakers Bureau was established to further promote our educational mission. By 2017 over a dozen members of MGGNO had spoken on a wide variety of topics at garden clubs and other audiences in the area. The Master Gardener Mini series was introduced in 2017 where informal talks were held for the public at several of the 20 plus projects MGGNO currently oversees. Many new projects began in the past several years, including a Westbank community garden and an LSU AgCenter Display Garden in Metairie. MGGNO increased its impact on the New Orleans Botanical Garden by incorporating new projects there as well, including the aromatic garden, vegetable plano, and vegetable cold bed studies. MGGNO also continued to be involved in bringing in speakers from outside of the area. In January, 2016 MGGNO hosted its Winter Symposium on the topic of native plants to a sold out crowd. That same year saw MGGNO as host to the LMG State Conference in New Orleans with a two day program that provided a wide variety of speakers from both the northeast and southeast. MGGNO continues to work with the LSU Ag Center and parish agents to bring gardening information to the public through projects, seminars, and lectures. Plans are underway to better utilize social media in order to further our mission.